Lunch for this particular day was very easy. As simple as making a sandwich! Use sushi rice leftover from the night before ( reheat mode on the rice cooker the minute you wake up). Fry spam as thin as deli meat ( if you can). Slice cucumbers. Open up a package of seaweed ( we usually buy in bulk food on Costco). 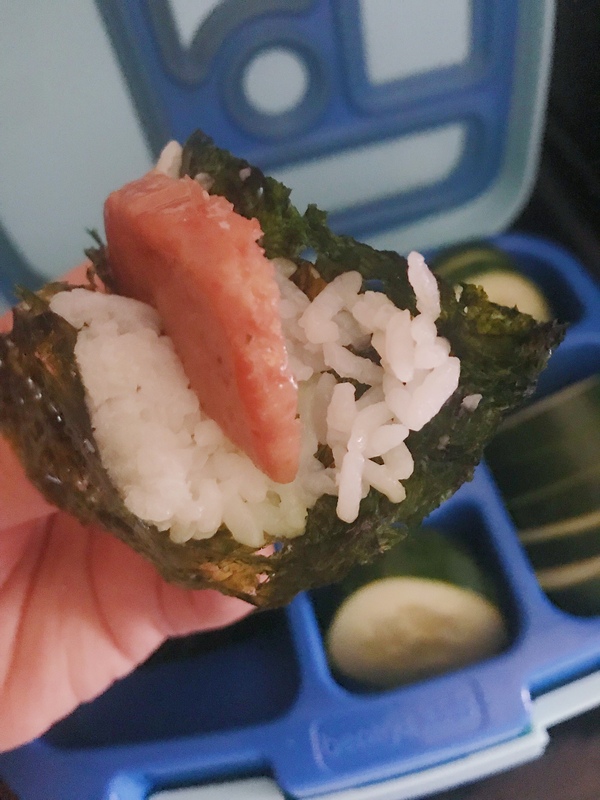 Spread on sushi rice and insert thin slice of spam. That’s all! The girls devoured this so quickly at home! 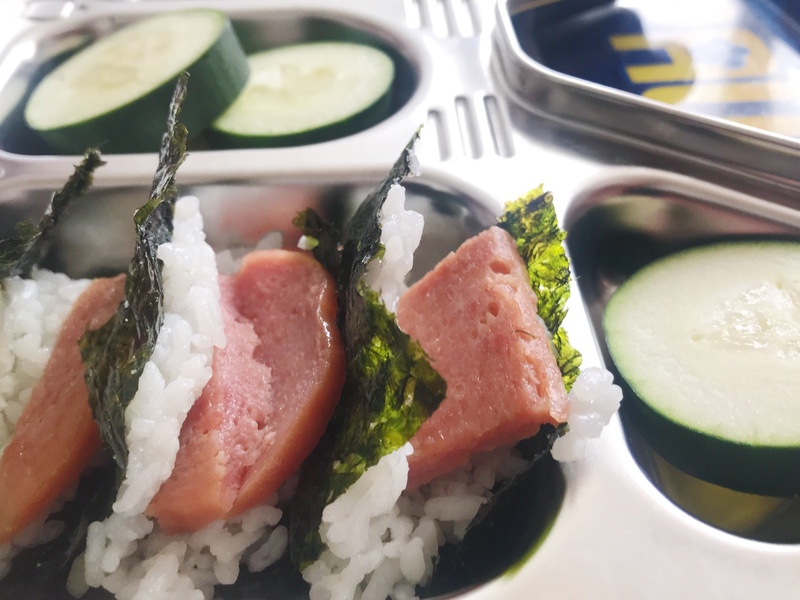 Have you ever made or had spam seaweed sandwich? I think this seaweed sandwich concept is so exciting. It’s like the much quicker version of the rice balls or onigiris I usually make when we are out and about. Think of all the things you can out as the filling! It’s like an Asian version of a tea time sandwich. I can imagine it going nicely with green tea. The only food that Olivia completely finishes that I pack without fail is jelly and butter toast; now I can add this to the list! 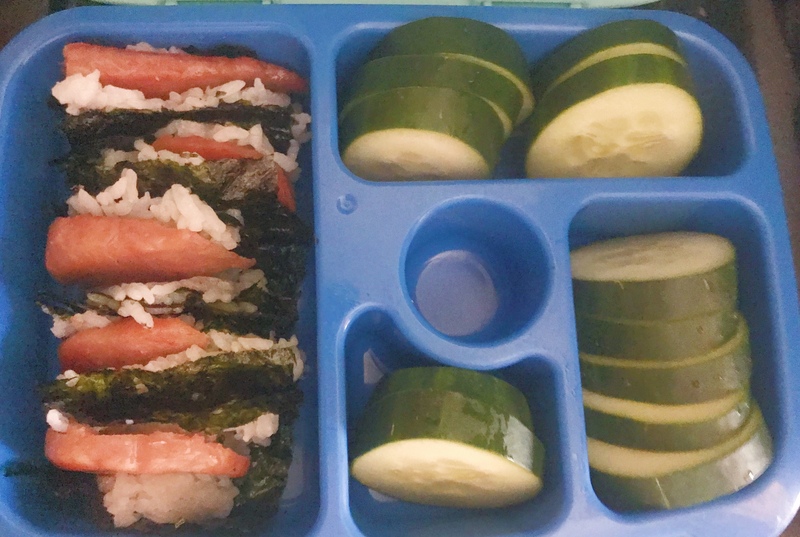 Every single piece of the seaweed spam sandwich was gone; every morsel of soft chewy sushi rice; every slice of spam and seaweed; and about 3 slices of cucumbers not all, but it’ll do). Victory for mama! How many of you pack lunch for your children? Could mine be the only one who often leaves it barely touched? 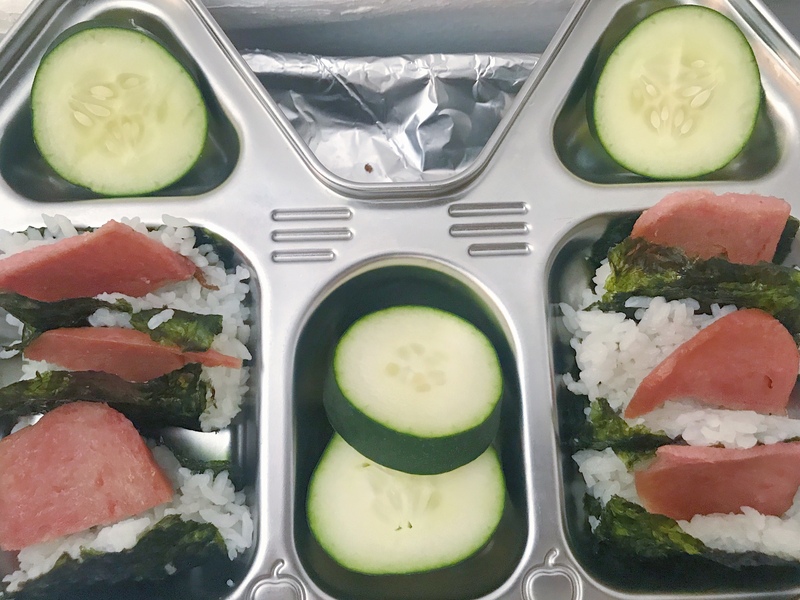 What are some ideas for children’s school lunch? Does your child(ren) have an absolute favorite? Previous Previous post: Keira’s 3rd and Ayla’s 4th Birthday!